The Environment Protection Authority board has called on the State Government to take “brave action” on the environment following the release of a major report outlining the state’s worsening climate, waste and biodiversity outlook. The drought ravaged River Murray at Goolwa in 2008. The latest State of the Environment Report – which is released by the EPA every five years and was published this morning – shows the number of threatened native plant and animal species in South Australia has risen to 12 per cent, with that figure set to grow in line with the state’s increasingly hotter and drier climate. The report also warns the volume of waste in SA has continued to increase at a higher rate than population growth, with the average amount of generated waste per year increasing by 42 per cent from 2003-04. A target was set by the former SA Labor Government to reduce waste generation per capita by more than 5 per cent by 2020, but the EPA has forewarned achieving that target now seems unlikely. 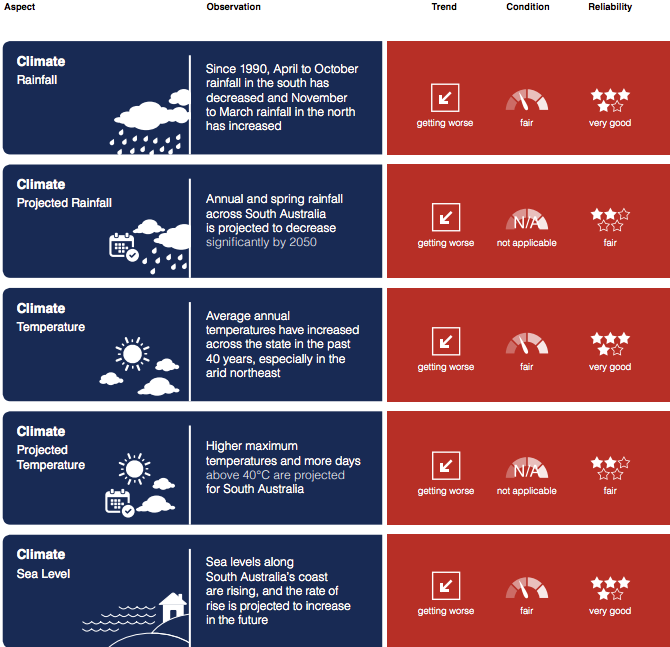 In September the Government published a series of damning report cards on South Australia’s climate outlook. Those report cards, which also feature in the EPA’s report, show average annual rainfall in SA is projected to decrease by between 5 and 15 per cent by 2050. The average annual temperature across the state is now 0.8 degrees Celsius warmer than in the 1970s and the frequency of days reaching over 40 degrees in Adelaide in the past 10 years has more than doubled compared with the period 1997 to 2007. Sea levels along South Australia’s coast have risen by between 1.5mm and 4mm per year from 1965 to 2016, with those levels projected to increase in the future – a trend the EPA has labelled “concerning” given more than 80 per cent of South Australians live within Greater Adelaide, a low-lying coastal area. Climate report cards from the EPA’s 2018 State of the Environment Report show worsening trends. In the report’s foreword, EPA chief executive Tony Circelli and presiding board member Catherine Cooper said while there were “outstanding” examples of some organisations looking after the environment, there remained several challenges facing the state’s climate. “The predicted consequences of a harsher future climate will test our ability, and that of our natural environment, to cope and adapt,” they said. Positives from the report include a 30 per cent decline in energy emissions per capita between 1990 and 2016, healthy air pollution and stable inland water quality. Despite increased waste output, the state is performing well on recycling, diverting just over 83 per cent of materials from landfill to resource recovery last annual year. Conservation SA chief executive Craig Wilkins welcomed news of the emissions reduction and increased recycling output, but he described the projected climate and biodiversity outlooks as having the potential to “devastate our way of life” if action was not immediately taken to curb projected trends. “There is no way to sugar-coat this – we are travelling poorly and the trend is getting worse,” he said. “Climate change is set to hit our state hard and our wonderful and unique birds, mammals, trees and grasslands are the ones that will cop it. Wilkins said it was essential that the State Government treat the EPA’s report “with the gravitas it deserves”, adding government funding cuts to environment programs correlated with worsening climate and biodiversity outcomes. “If this was a signature report on the economy or the health system, results such as this would jump-start the state government into immediate emergency action,” he said. “Step one is to start reversing the massive cuts to the environment that have happened year on year for a decade. Environment Minister David Speirs said the State Government was considering the EPA report in detail. “One of the report’s key recommendations is that the State Government reviews its climate change response, ensuring that climate risks are embedded in all future planning and investment,” he said. That investment included $100 million towards the home battery storage subsidy scheme, $10 million to establish Glenthorne National Park in Adelaide’s south, $5.2 million for coastal protection and $2 million towards the Greener Neighbourhoods program.